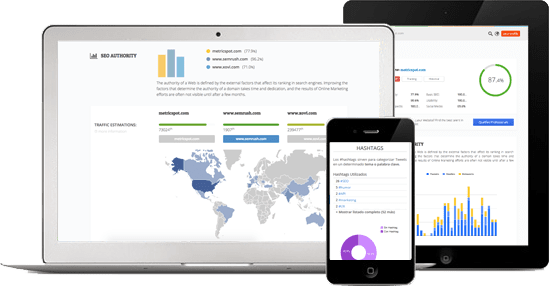 SEO Analysis, Backlinks Analysis, PDF Reports and many more: our tools Suite helps you analyze and optimize your website and those of your clients. En @metricspot son de lo mejor en herramientas de análisis web y #SEO y encima patrocinan #WCChiclana como AUTOR. ¿Se puede ser más majo? Generate a website analysis & optimization report that measures more than 80 metrics that influence your ranking in Google. Customize your reports with your logo and download them in PDF in order to hand them to your clients. Discover and analyze the 200 most popular links pointing to your website ordering them by quality and score. Add your target keywords so you can track your website's SERP rankings and stay one step ahead of your competitors. Analyze your competitors' marketing strategy with our website comparison tool. Stand out from the competition! Automate leads generation by offering customized SEO reports to your potential customers on your own website.